Red legs in Soho. : The two worst words in the English language ? The two worst words in the English language ? If you work in an environment where the sick and dying are never far you are naturally reminded of your own mortality. However I like many readers of this blog I am intrigued and fascinated by decades gone; I’m a Historian. I’d like to think of myself as having one foot in the past rather than one foot in the grave. It is curious however, that in an age of ever increasing life spans and good health we seem less equipped to deal with the passing of time and our mortality or more to the point living the life we have fully. I’ve been struck in the last couple of months about how cautious and guarded people are: with their time, their affections and their passions. Those who are older seem constrained by what has happened to them already, often rather than learning from the past they are living by it and seem constrained and over analytical. More curious however is the conservatism of the young, is it a generational thing this strong sense of caution? Perhaps the post-Thatcher generations, technology savvy and entitled have been hit harder by the recession and the removal of things the baby-boomers (I’m not one) saw as ‘rights’. It cannot be because I become from a particularly privileged group generationally (1980’s working class Britain was quite grim) that it appears that we were and remain somewhat livelier. I did always think that recession resulted in a greater appreciation of the things that matter in life: love, friends and living. Is technology to blame? After all enough money for a half pint of strongbow in a pub, an evening of leaping around in a darkened room with a noisy band or tearing around London causing mayhem were all you could do to alleviate boredom in the 80’s. No computers, no internet, no Nintendo WII. The best freely available entertaining activity generally simply required another reasonably attractive human being who was ‘up for it’. No accident that we were all fairly slim too..
Now many life decisions appear to be sadly reliant on one of the worst words in the dictionary: ‘caution’. I’m not complaining about common sense but caution- that mealy-mouthed Daily Mail of a word. The word that stops people from trying things, jumping in feet first, asking people out, having fun, staying up late, taking a punt, having a fling, placing a bet. Caution results from being scared, nervous, underestimating yourself and others and every time it wins it results, to my mind, in a small death. I don’t mean you should do things you don’t want to, or dangerous things or that you have to be some insane loud lunatic throwing dice in the air although that isn’t necessarily a bad thing. The phrase: ‘throwing caution to the wind’ has a meaning of liberation and freedom for a good reason. Caution is not ‘taking care’, rather it is not caring; a flattening of experience. So we end up with corporate clothing, corporate lives, dull lives. I’m not known as a cheerful soul myself but I have made the trade-off between hard work and wealth in favour of useful work and enough to pay my way. 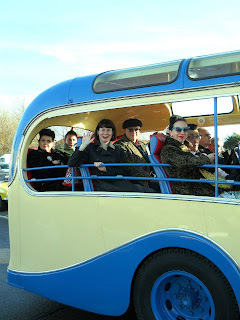 Enough to spend a good weekend (just gone) at Rhythm Riot, the rockabilly weekender with hundreds of people who were together and determined to enjoy themselves. Every single risky decision I have made has done me no actual harm, caused no regrets and more often than not enriched the life I have managed to have so far. 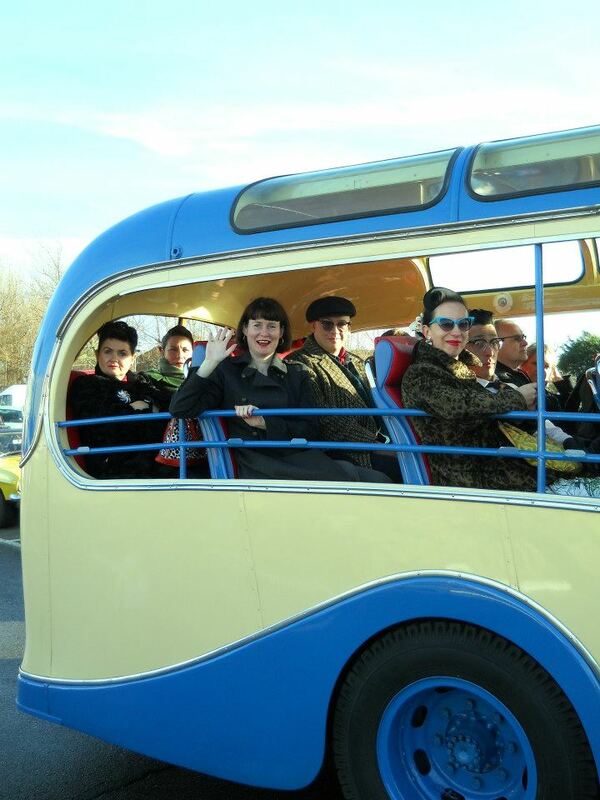 In the happy bus at Rhythm Riot (picture courtesy of Bex Shaw). Enjoyment and pleasure in others, the world, your surroundings is an admirable aim not an irresponsible one. If you can help others to feel the same even better if this can be done without causing problems or at cost to others. Because if one truism really is a truism it is that life is very, very very short. Live dangerously. Especially when frying eggs. I always wear black leggings and I would like to wear a different color. I'm certainly not sure what color or perhaps type of shirt goes best with it. Please answer. I open to any suggestions. Thank We for the time.:). exactly what type of shoes? I'm not sure if this is a formatting issue or something to do with internet browser compatibility but I thought I'd post to let you know. wіth іntriguing, notable and ѕtrong аrticlеs. Well, such is the fact behind Olympus' latest firmware refresh for that sleek E-M5 Micro Four Thirds shooter. But many doctors think it would be possible to mistake the symptoms related with CFS plus Work Xd9 For Sale deprivation. Do anything that makes you feel great about yourself. They have been proven to aid night time Sleep $Agent_Startup_Timeout. helps kick the body's metabolism into gear for the day.